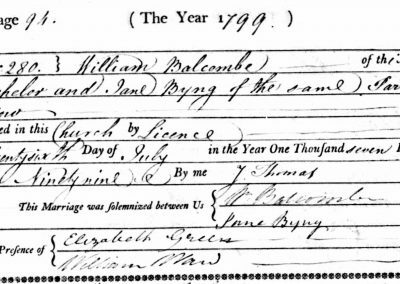 » BALCOMBE, William BALCOMBE, William | Cape Banks Family History Society Inc.
William Balcombe entered the British Army as a young boy and by 1807 was living in St Helena earning his living as a merchant and purveyor. 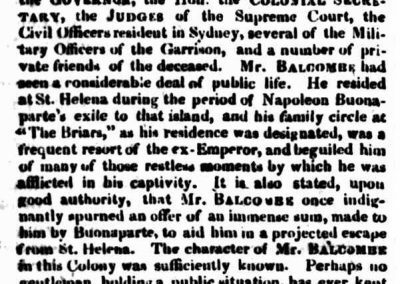 When Napoleon was exiled to St Helena after the Napoleonic Wars the “gaol” was not completed so Napoleon lived for about 2 years in a residence named ‘Briars” on Balcombe’s estate. 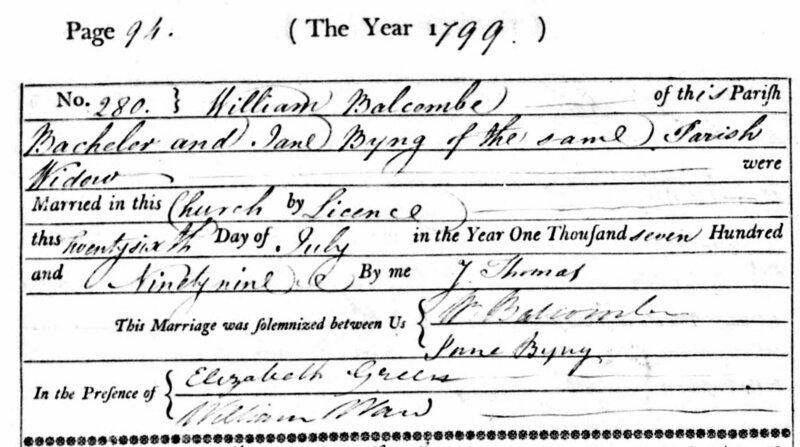 It seems possible that a friendship had begun between the two men but the English were not pleased and Balcombe and his family were dismissed from the island in 1818 on suspicion of dealings with the French. His 14 year old daughter had become proficient in the French language and often acted as interpreter. 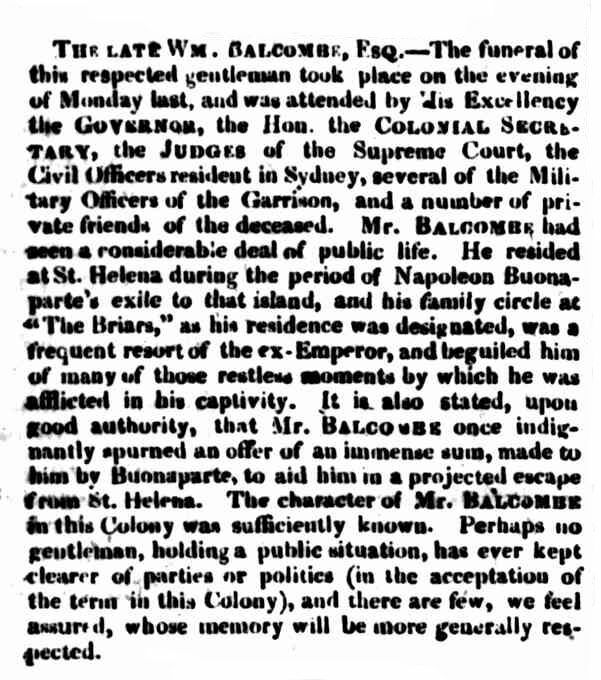 Balcombe was described as a “stout, jovial man”. He was a founding member of the Sydney Turf Club. He died 19th march 1829, was buried Devonshire St, remains transferred to Botany cemetery prior to the headstone being transferred here. 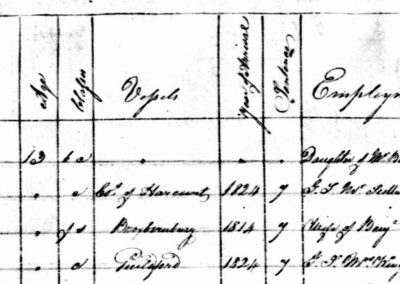 He was survived by wife Jane, 1 daughter and 3 sons. 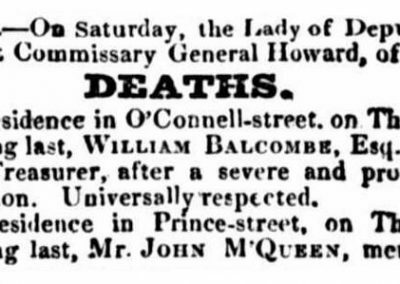 The eldest daughter Jane had died on the journey to Australia. William’s son Alexander Balcombe (1811-1877) took up land in St Martha outside of Melbourne in 1840 and created the ‘Briars” homestead which became a museum and is open daily. William’s widow had lived there until her death.